3.2. Why Is Organization Important? 4.1. What Is a “Business Process”? 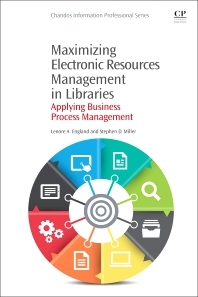 Maximizing Electronic Resources Management in Libraries: Applying Business Process Management examines the use of Business Process Management (BPM) and the ways it can be beneficially applied to electronic resources management (ERM) to help organize processes in libraries. The book offers librarians a skillset that will make them ready for a variety of library environments. It focuses on the organizational tools offered by BPM, including key elements of ERM functions that lay the groundwork for the present and future use of ERM, and how they will drive methods by which libraries provide access to resources. BPM theories are then reviewed, along with a discussion of present applications of BPM to ERM and a final look at possibilities for future applications. Lenore England is Assistant Director for Electronic Resources Management at the University of Maryland University College (UMUC). Lenore is responsible for ERM, financial, and procurement matters for the UMUC Library. She received the 2012 Association of Library Collections and Technical Services/Collection Management Section Coutts Award for Innovation in Electronic Resources Management. Lenore holds a Master of Library and Information Science from San Jose State University School of Information, and a Master’s of Business Administration from George Mason University.